Let’s go through the above diagram in a little more detail. “Animal” function object is created. Animal gets assigned a property named “prototype” and a new object is assigned as the value ofAnimal object’s “prototype” property, I’ll refer to this object as “Animal.prototype”. 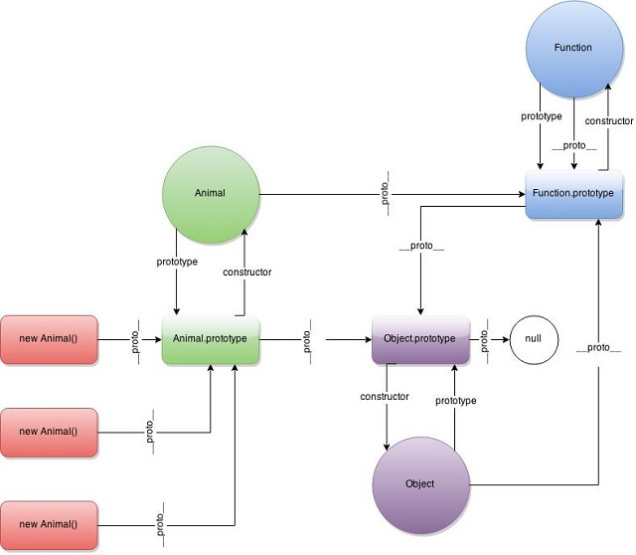 Animal.prototype object get a property named “constructor” which points back to the “Animal” function object itself. both have internal link “__proto__” which points to “Function.prototype”. “__proto__” property of “Object.prototype” points to null. “null” object is where the inheritance chain ends. For each function call like “new Animal()“, a new object will be created and all such objects will have the internal link __proto__ to Animal.prototype. Finally where does “Function.__proto__” link points to? well it points to the same object which “Function.prototype” points to. Note: Use of __proto__ is debatable because it was not originally included in the ECMASCRIPT specification but in ECMASCRIPT 6 it has been included in the specification and has been standardized. There are other ways we can access the link object, I’ll mention those methods later in this article. When we create a new object of function “Animal” using “new Animal()”, then a new empty object is created and “Animal.prototype” is set to its internal link “__proto__”. What’s the Deal with Internal Link “__proto__”? In prototypal inheritance object inherit properties from object dynamically this is different from classical inheritance where Classes (blueprints of objects) inherit from other Classes. Output or the above code is “name” unsurprisingly. So we can see we have only “name” property in person1 object. Let’s run the following piece of code. And we can see it does print out 24, so even though person1 object does not have “age” property, we can still access its value because its prototype has that property. As shown earlier, you can access it using “__proto__” property. That’s all that is needed to create working inheritance from one object to another. Here object y is derived from object x. Now mgr object inherits properties and behavior from the Employee and Manager both and you can access those as if they belong to the object itself.